Ever return from vacation and find yourself craving all the vegetables? Well, that’s me. After saying yes to just about every Mai Tai that came my way last week, I’m ready to hit the produce aisle hard. It’s amazing the shift that happens the moment I cross back into my driveway. Bags aren’t even unpacked yet and I’m already craving my normal routine, gym time, and lots of fresh, clean tasting food. To help me get back into the swing of things, I created these zucchini noodles that are so unbelievably zesty and earthy you’d have a hard time believing they are made almost entirely out of vegetables. 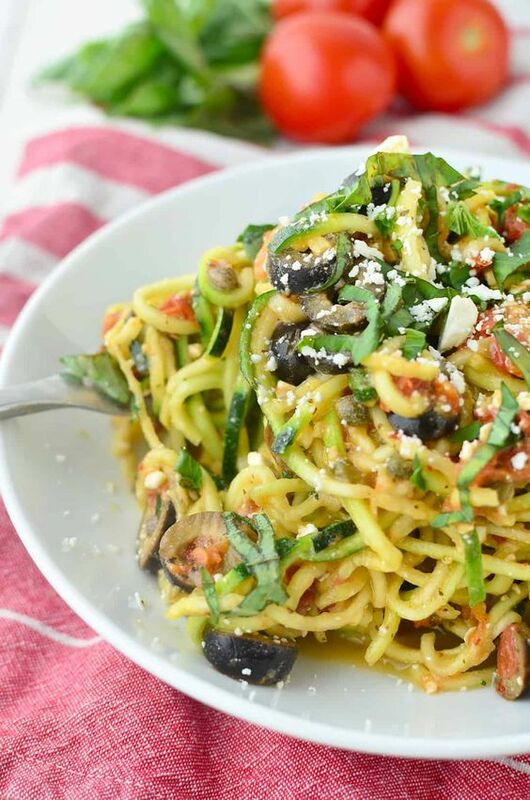 Ribbons of freshly spiralized zucchini in a tomato-olive sauce, tossed with just the right amount of basil, oregano, capers and tangy feta cheese. 1/3 cup thinly sliced basil leaves. Spiralize the zucchini and place in a large bowl. Heat the oil in a large skillet over medium-high heat. Add the tomatoes and garlic and stir until tomatoes have softened, about 5 minutes.